Recently-graduated high school students Sam Baumgarten and Graham Hughes have developed a pretty rad robotic gripper with the help of Arduino and 3D printing. The gripper itself consists of three large hobby servos joined to the fingers with a linkage. 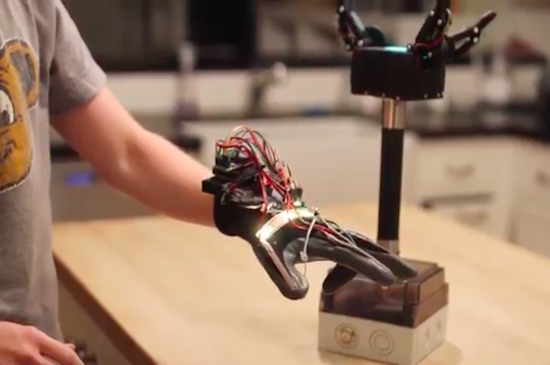 The underactuated fingers have a force sensor under each contact point, while the control glove is equipped with tiny vibrating motors at the fingertips. This, of course, provides haptic feedback to ensure that the user doesn’t crush anything–the greater the pressure, the stronger the motors vibrate. If you think this sounds awesome, wait until you see it in action. Both Baumgartnen and Hughes (who actually created the original prototype shown below) have shared demos of the project, along with a detailed breakdown of the build. Kudos to Hackaday for finding this incredible piece of work!